Stuart and Susan invite you to come and stay with us in our superb refurbished granite vicarage which has magnificent views overlooking Loch Carron. 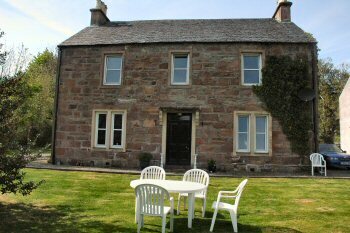 We are on the outskirts of Lochcarron village but within easy walking distance of the café, shops, pub and restaurants. The photo below shows the Old Manse as seen from Slumbay Island. It is the house to the left of the picture just back from the water's edge. 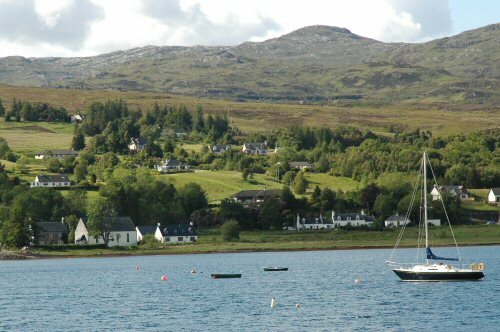 Lochcarron is situated on the west coast of the Scottish Highlands, some 63 miles west of Inverness, and is an ideal base from which to tour Wester Ross and Skye and Lochalsh. This area of the NW Highlands boasts some of the finest mountain scenery in the whole of Scotland. Within easy reach are the Torridon Hills, the spectacular drive to Applecross, and the whole of the Isle of Skye, to mention but a few. • Free wi-fi Internet access • Rooms available from 4pm until 7pm (although later arrival until 9.30pm is available on request).